Now, at age 60, Dr. Yang has undertaken a groundbreaking project: he has created the YMAA Retreat Center on 240 acres of remote woodlands in Northern California, isolated from the distractions of modern society. The Center’s established infrastructure includes a solar array for sustainable, off-the-grid power; a spring-fed well; and facilities for living and training. Far from his home in Massachusetts, this quiet place in the forest is entirely dedicated to what Dr. Yang describes as his final mission: to transmit his complete knowledge to the next generation of teachers and preserve the Chinese martial and healing arts. Dr. Yang will be reviewing candidate applications from around the world until early 2008, in a search for 10 to 15 exceptional young students willing to commit to 10 years of living and training in the mountains. Graduating students will be conferred the title of Master of Traditional Chinese Martial Arts. The 10-Year Training Program will commence in August 2008. As the YMAA Retreat Center develops it will be a beacon, leading by example to reestablish the model of the ancient way of training, while forging ahead with a comprehensive curriculum that includes many more aspects of classical Chinese culture. The training will integrate "Wu De" (martial morality) principles into daily life, such as humility, honor, discipline, patience, and courage. Each graduating student will go on to form his own school, based on the model of the Retreat Center, and will continue to preserve and raise the standard of the authentic Chinese arts and culture in the West. Dr. Yang took time out from his schedule to discuss the Retreat Center and the passion that drives him to preserve the traditional Chinese martial arts—before it’s too late. JS: It’s important to you to try to correct some common misconceptions about Chinese martial arts here in the West. What are some American misconceptions? Dr. Yang: Many mistakenly think that taiji training is only for health and relaxation, and they forget the martial arts root. But the root is most important for the creation of the whole art. I try to bring that root back, introduce what the real Chinese martial art is. Even on Mainland China today they promote a lot of the beauty of the taiji forms, but they ignore the essence of the arts. The martial arts root is missing. 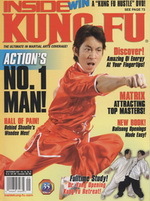 But today the worst problem is that martial arts become a business. When it becomes a business, everything is shallow. Nothing is deep. The feeling of the ancient art is missing. JS: It must be very frustrating for you when martial arts in this country can be surface— like a business. Dr. Yang: Yes. That’s why I try for last 30 years to introduce the right way for the traditional martial arts in this society. I know I have some influence, but creation is so slow. These arts are really worth preserving. With these foundations of training, people learn discipline. They learn the meaning of life. But today that meaning can disappear, and it’s only for money making. JS: Can you feel any positive change happening? Dr. Yang: Yes I do, because now more and more people are searching for the martial arts root in taiji training now. People have more open minds. I know that it will only take more time, but I am afraid that once I’m gone, everything will go back to the business side. So I need to build some people to continue my work in this country. JS: So that’s the motivation for the YMAA Retreat Center. Dr. Yang: Yes. I am looking for 15 abnormal students. They are not normal, and they have to be young, from 18 to 20, because when they get too old, physically, it is just not easy to train. JS: Did you say you are looking for abnormal students? Dr. Yang: Abnormal. Yes. (laughs) By that I mean unusual, remarkable. They must be pretty mature. They must know exactly what they want. They must have a strong will already. I am hoping I can find 15 around the whole world. If they were normal, they wouldn't stay there for even one month. JS: You are looking for those few who are different. Dr. Yang: Yes. Ideally, but these students need to have their high school education first. I will accept 100 applicants. They have to write an essay on the meaning of life and answer a lot of questions. Will they be willing to accept the discipline and punishments? If they cannot do that, then I am sorry, I can’t teach them. From 100, I will choose 30. I will take these 30 to the Retreat Center in California for two weeks, to live together in two groups of 15 people. I will get to know them, they will know me and each other, and they will know what kind of training is expected. From 30, I will choose the 15. JS: How long do you think that process of selection will take? Dr. Yang: About one year. I have to be so careful, because I am 60. I have only a one time shot. The art is dying. I have to preserve it. If I don’t preserve it… I know it’s going to come back, sooner or later, but if it isn’t in this generation, in my generation, then I will be guilty. JS: It seems to me that this surface, shallow, money-culture is something that will come and go. It hasn’t always been this way. Dr. Yang: Yes, but you know, people today treat all kung fu or martial arts like some kind of fashion that comes and goes. It’s not a fashion. It’s an art. It’s like classical music. Rock music comes and goes. Classical music, you can listen to for hundreds of years. JS: I’ve been reading about your schools in other countries. Is that how you’re getting the word out about finding these 15 special people? Dr. Yang: So far, of the people interested, half of them are YMAA students. They already know the system, and they know what they want. JS: You are considered to be a very open teacher. You give a lot of information that some others might hold back. Dr. Yang: Yes. It’s a Chinese tradition to hold back, and there’s a reason that the Chinese have that habit. With self-defense, if you reveal your secrets to the enemy, the enemy will know you and you don’t know your enemy, so you are in trouble. The Chinese kept their secret, and by generation and generation everything is a secret. But when you look at the last 40 years, the art is dying so quickly. The lifestyle has changed now. My motivation to teach is to preserve the arts. The most important thing that has influenced me so much is that my white crane master passed away in 1978. I was so sad. So much of his knowledge was taken with him and buried underneath the ground. I don’t think he taught even half of what he knew. In front of his tomb I swore that I would preserve anything I learned from him. And when I came back to the United States, my books started coming out. JS: What will the training will be like at the retreat center? I understand that there will be more taught than martial arts. Dr. Yang: Yes. I try to put myself in the students’ position. Once they get out, can they survive? They have to learn how to produce DVDs. How to write literature, write articles, write books. I want to encourage them to follow the same path as me. So they can write, they can produce, and preserve the art so they can spread it out. They have to learn English. They have to learn Chinese culture. They have to learn cooking and music and painting. All these things. To make them feel like they still have a life. So their life is not only martial arts. In this case when they get out into society, they can fit in very quickly. JS: And that differs from the YMAA schools you already have, which teach solely the martial arts. Not language and things like that. Dr. Yang: Right. We can’t. We’re limited, because students come and go. It’s very frustrating. Today they cannot take discipline. A lot of students, after they train, and then I just give them a little of what discipline’s supposed to be, and they quit. They think I’m giving them trouble. I tell you— my master would hit us. He would give us trouble. And we were so happy! Because that means the master is paying attention to you. It means the teacher likes you. But today, no. You cannot say anything. You say anything, and they are discouraged. JS: When you begin a relationship with a new student, do you try to explain that to them from the beginning that there’s going to be discipline? Dr. Yang: Usually I don’t try to explain. The older students teach them, and they know what discipline is supposed to be. Otherwise, all my time would be babysitting one by one. It’s impossible. JS: Let me ask you more about the center itself. It’s very remote. It’s far away from things like electricity. Dr. Yang: There’s a town of about 5000 people 20 minutes away, so we can get supplies there. There’s a hospital there if anything happens, if you want to go to a bigger city, it would be Eureka, about one hour and ten minutes away. JS: It’s a beautiful area. Can you explain why you want to bring them to such a remote place? Dr. Yang: I believe that much of the reason students cannot stay for a long time in training today is because of so many distractions. Chinese martial arts were created in an ancient lifestyle. The ancient lifestyle doesn’t have modern attractions. So I believe the best way I can do it is to take them to the mountains and just train them and imitate the same way as ancient times. Dr. Yang: Yes. In this case they will stay there nine months of the year, and then for three months they go home. I’ve already experimented. Four times, I took 15 students there for two weeks. They trained only a few things— and you wouldn’t believe it. In six hours a day, they improved so fast. In two weeks, the quality of improvement is almost equal to the student practicing for six months. All they do is just train the same thing, the same thing, until they get a feeling for it. JS: That must give you a lot of hope that when you get the students there, they will improve quickly. Dr. Yang: Yes. I believe that in only about the first five or six years, they will learn almost everything that I know. The one thing they won’t have is experience. Experience takes a lifetime. For the remaining four years, I am going to invite outside masters to come in and teach them different things. JS: What difficulties do you expect might come up during this extended period of training? Dr. Yang: The most difficult is that after a while they may realize that they don’t want it. I would not try to convince them. If they find out they don’t want to be there, then they have to go, because that means they are not ready. The second thing is that since they are only 18 to 20, emotionally they are still dependent on the family. JS: That will be challenging. Dr. Yang: Yes. Other than that, you know, financially, as long as I can raise enough money it shouldn’t be a problem. The major expense is the buildings. The food is not very expensive. We can cook for ourselves. JS: You said earlier that you plan to invite other masters to teach at the Center, but only in the later half of the ten years. Dr. Yang: Yes. When I learned different styles of kung fu training, like White Crane and Long Fist, it took me 13 years. Every style you try, you need about ten years. So the students learn about six years from me, because my understanding is limited. After that, they can continue learning from some good masters. They have to focus on the three styles I know, because that’s how I can teach them deep. But you cannot say, okay, I like Chinese food, I will only eat Chinese food. Or I like Italian food. You have to taste from other styles as well. In China there are so many martial arts styles. To become a teacher in the future you have to have knowledge of other styles, and experience as well. JS: And your goal for the center is for the students to keep the arts alive and carry them into the future. Dr. Yang: Yes, and that’s why I try to provide them with enough tools before they finish. So when they get out, they can depend on that and continue to spread it out, through publication and through teaching, just like me now. JS: Do you see your work now as being mostly about connecting the past with the present and the future, as in trying to keep the arts alive and keep them from dying out, or about connecting the East and West? JS: What, besides preserving the arts, is the reason for this training in modern times? How do you see them as addressing the problems of modern times? Dr. Yang: If I can find this answer, and can prove it, then people will accept it, and it will become a discipline of today’s society. Today’s martial arts society, all they teach is martial arts. But part of martial arts training is martial morality (Wu De); they ignore it completely. It’s a kind of self-discipline, and it’s disappearing. So—I need to use martial arts as an educational tool. To teach a new generation about what is morality. Morality is not only to yourself, but also to the people. It’s a mutual relationship. These kinds of things are disappearing. The worst part with today’s kids is that they don’t have a sense of obligation. Kids are always thinking "me, me, me". Before, we used to think about "you first, and then me". Now it’s just "me, me, me. It’s your fault, it’s not my fault". That’s today’s concept. It’s really bad. JS: For thoughtful people, it feels very empty. Dr Yang: Yes. That’s why I am trying to hopefully establish a good impression to the whole human society through martial arts we can produce a good human being. JS: What will become of the YMAA Retreat Center after the ten-year program? Dr. Yang: After the ten years, the Retreat Center will be used for continued YMAA training. Perhaps another 10-year program will start. But I won’t be there. I give myself right now ten years to live. That's why it's urgent I find students who understand that this is my last chance to transmit what I know. JS: Do you really look at it that way—like you are working with a limited time of ten years? Dr. Yang: If I can look at it that way, I create my own whip. So when I create this whip to push me, I cannot be lazy. If I say, Oh, I will live 100 years, I still have time, it will never happen. That’s my own whip. JS: Well, I hope you are still saying that for 30 or 40 more years. You’ll get a lot done. Dr. Yang: Well, as long as I am alive, I can feel like I am still fighting. Currently: Over thirty books and fifty videos and DVDs published on the martial arts and Qigong translated into many languages, including French, Italian, Spanish, Polish, Hungarian, Dutch, Czech, Bulgarian and Russian. Throughout the year, Dr. Yang travels between YMAA International Branch and Provisional schools worldwide. He also frequently travels within America and around the world presenting lectures and seminars on Chinese martial arts and Qigong. For more information on Dr. Yang and the YMAA Retreat Center, please visit www.ymaa-retreatcenter.org. Those interested in becoming a candidate, visit www.ymaa.com/retreat-center.